We designed a modest, site-attuned dwelling to Passive House standards as an extension of the family’s homesteading commitment. Perched by the forest edge, to encourage casual childhood adventures. Sheltered by the wooded slope to be shielded from winds. Angled to collect and store winter solar rays. Oriented for a welcoming, protected entry. Earth-bermed to enhance insulation, direct run-off, and silence road noise. To the north is the sleeping tower. Its basic form and minimal openings respond to its prosaic functions. To the south is a single living space, lifting up to a south-facing window positioned to regulate solar gain and to selectively frame a neighborless vista. The entry hall is also the main circulation spine and the mudroom. The wheeled dining table can be tucked under the kitchen island for daily meals or pulled out to accommodate eight or more. The first floor bathroom is divided by a door into a front guest toilet with an integral sink/tank; and a master bath beyond containing the shower and master sink. The upstairs landing accommodates a kids’ reading nook. The children can slide a single door in their bedrooms to reveal either a clothes closet or desk. Envelope Investment - We employ extreme insulation, thermal mass, best practices for construction, and synchronized air-exchange. 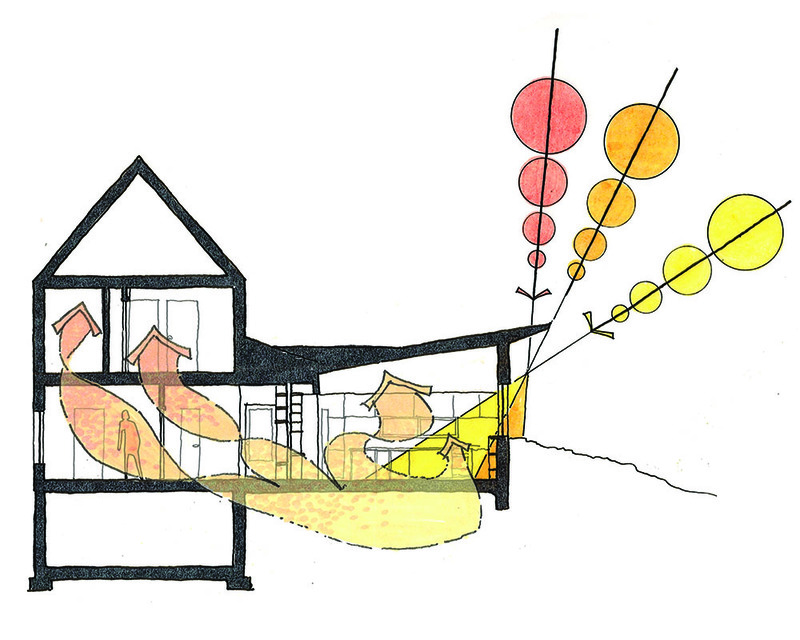 A wall-mounted air-source heat pump is the only heat source other than a small wood stove. A cord of firewood was the only fuel burned in littleHOUSE’s first winter. Through all these measures, we aim to meet a family’s vision of independence, lifelong stewardship, and closeness to nature.